Orangeville, Ontario, Canada and his crew built and fired a small viking era iron furnace as part of a continuation of their experimental archeology research into how iron was made 1,000 years ago. For practicality some modern contrivences were used. An electric blower was used. In the past they HAVE used reproduction hand bellows and proved they could do it. It takes three or four STRONG people to man the bellows all day long. This dedicated manpower is difficult to come by. They did not cut the wood and process their own charcoal or make their own bricks. They DID build the furnace with a clay and staw mix to historical dimensions. They also sized the charcoal by hand and carefully fed the furnace for over 8 hours after which they had to forge the bloom into a solid mass by hand. It is a LOT of work. And they made a good quantity of wrought iron (about 25 pounds). "We roasted and broke up the raw ore on Friday afternoon as part of the 'setting up' demonstration. (Well, Ken and a volunteer from the audience did.)" "Our final production was 21 lbs. this out of 65 lbs of ore, so a yield just below 30%. Right on target!" Before we continue with the smelt. . I've been at several smelts and even with different styles of furnaces the processes and needs are nearly the same. We have often gotten the question "How do you make wrought iron" or "I want to make my own steel" The following is universally true. 1) Most important, you need several friends willing to baby sit the furnace for as long as 24 hours or more from the time you build it to when you remove the bloom. A two man crew can do it but I recommend 4 to 6. Once you start you are committed rain or shine. Plan on eating and sleeping with the furnace, standing in mud sleeping (if any) in the cold and breathing the furnace smoke all that time. 2) Next most important, you will need your crew friends to help consolidate and forge the billet OR you will need a hydraulic press and fairly large dies. 3) To make the "wrought" you start with high grade iron ore (you may have to dig it up or mine it yourself). It then needs to be roasted and crushed into sand or pea gravel size grains. 4) Ore needs flux. Some ores are self fluxing others are not. You need the chemistry of the ore OR need to run a dozen of so experimental smelts to figure it out. It helps to know some metallurgy and chemistry. The slag in wrought comes from the ore and flux combination and is critical in making wrought iron. 5) You need fuel. Foundry coke broken down is possible for making cast but tricky on wrought. Most makers are using charcoal mostly because it is easier to break up and it has no sulfur. The fuel must be broken up and screened to a specific size depending on the size of your furnace. Anywhere from a dozen to two dozen 50 pound bags are necessary per smelt. Running out is a disaster. . .
6) You need a furnace with controllable air supply and tuyere. 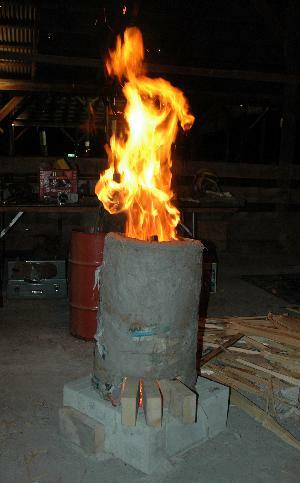 Furnaces are built from clay and or refractory materials. You will also need patching clay and extra refractory. When held at 2,400°F for many hours (occasionally 2850°F) parts of furnaces crack and fall apart. . . All materials, even refractories, weaken at these temperatures. Furnaces can be permanent or temporary. Some temporary furnaces last for a couple smelts others only one. Permanent furnaces are more expensive and hard to correct design flaws but take less time to setup and use after they are built. 7) You will need some special tools, big tongs, rams, bot holders, pikes, fuel screen. Also some standard items, trowels, mortar box, mallets, scale (to measure ore). You will also need foundry/heavy welding safety equipment such as gloves (multiple pairs) face shields, reflective gauntlets and body armor. 8) You need knowledge and practice. Most folks that do smelts helped someone else. 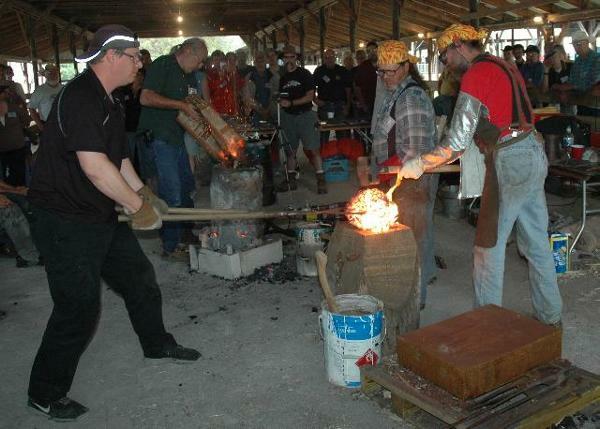 The fellow running the smelt is the "Ironmaster". Ironmasters were always the folks with the most education and management skills in any group (family, village, consortium, company). They are also hard workers and keep track of every aspect of the smelt, time between charges, fuel, flux and ore ratio in the charge, the amount of air. Without records there cannot be success OR improvement. You MUST know what is going on. As part of your crew you need a "Second" that is at least familiar with all these things and preferably capable of being the Ironmaster. Others on your crew should clearly know what their jobs are and to perform them without asking. While the Ironmaster and Second MUST be absolutely committed to the process the others need to be NEARLY as committed. AND you need a place for all this to happen. Room for the furnace, places for the crew to hang out with facilities to use. . .
We are NOT talking about a large operation. We are talking about a very small furnace three or four feet high (like the one in this article) capable of making a ten to thirty pound bloom per heat IF operated well. Poorly operated you may get cast iron, discontinuous particles of iron or nothing. Making Wrought is Making or Smelting Iron. It is not easy.